That Virtual kid sure plays a mean pinball! Launch the ball on to the table and use flippers to stop it falling out of the playing area, smacking it around the table over ramps and against targets to get points. That’s how pinball works in amusement arcades and it’s how it’s worked for the many computer and video game versions released over the years. Galactic Pinball is no different. Visually the game appears a little odd. Partly because the ball is actually a puck, but mostly because the tables are all set against a star field backdrop. The 3D effect is good as you see the table stretching back in front of you, but whilst the intention seems to be to give the impression of a table many miles long, it instead looks like a regular-sized one that curiously has no base to it. However the posts, ramps, flippers and other objects come together to make solid, well designed tables. The controls feel very natural with the L and R buttons controlling the flippers which move as you’d expect. You can also use the d-pads but using the two triggers feels more like controlling a real machine. A is used to launch your puck with the length held down (as in all other pinball games) determining the power. Should you want to give the table a nudge, this is done with the B button and as you would expect overdoing it causes a tilt, disabling your flippers. The behaviour of the puck is spot on, deflecting off objects as it should, travelling as far as you hit it and falling (when gravity takes over) at the right speed. There are four tables that are all different, due to the position and number of flippers and the arrangement of targets. As you play you will find different things to give you points such as spelling out words or triggering a roulette wheel. 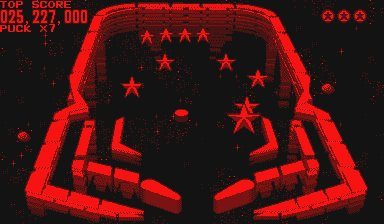 Collect enough tokens on a table and you are transported to a bonus table where you flick your puck at stars to get extra points – or if you prefer you can just collect an instant (but potentially smaller) bonus. Certain actions can even effect the appearance of the table. For instance sending the puck to the “Alien Lair” target on the Alien table causes an alien head to appear providing you with new scoring opportunities. The sounds in the game are typical bloops and blips as you rack up your points. There’s also a few speech samples such as “bonus” and the table names – though they aren’t always particularly clear. The music quality is mixed. It has, unsurprisingly, a spacey feel to it. Open up a time-limited target and a fast exciting track plays. 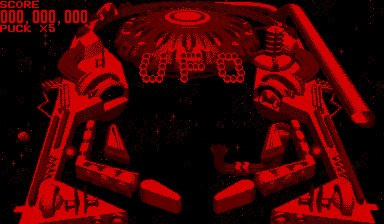 Also the low-key atmospheric beep-bipping music that plays over the opening title and adjustment screens, slowly builds and works very well but the highlight has to be the track that plays on the Colony table that has a great exploration vibe to it. Less impressive are the tracks that play for the Alien and Cosmic tables which are chirpy to the point of annoyance. They don’t really distract but it’s a pity that there isn’t an option to turn the music off or perhaps listen to one of the other tracks. The game saves the high scores of each table on a list which adds a lot of replayability as you either compete with someone else or try to better your own record. With four tables to learn your way around, it keeps your interest but as different as they are, you are just whacking a puck around which can make things a bit repetitive. However it’s this simplicity that makes it addictive and it certainly won’t bother you if you are busy chasing a high score. Some dodgy music aside, this is a decent pinball (or rather pinpuck) game, with everything physics-wise behaving as you would expect. That the 3D effect doesn’t convey the size that was probably intended is forgivable as it is a simple and addictive game that the Virtual Boy’s control pad is well suited for. After achieving a self-set target it may be a while before you feel the urge to play again, but when you are hoping to reach a certain score Galactic Pinball is a game you will find yourself playing a lot – and enjoying immensely. "That Virtual kid sure plays a mean pinball!" Nice. 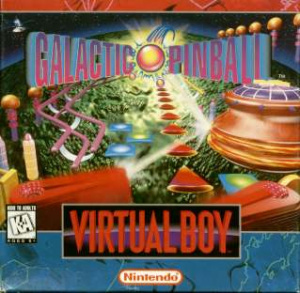 I also would have accepted, "Go to the virtual, boy!" This is the only pinball video game I've ever enjoyed enough to play more than once. Pinball for the NES ate up hundreds of hours of my young life. I'm serious. I'd have friends over and we'd stay up all night drinking soda and eating chips and playing that stupid thing. It MIGHT be my most played NES game, timewise. Metroid Prime Pinball is pretty cool as well. @Adam - If you haven't tried it yet, pick up a copy of Pinball Hall of Fame: Williams Collection. It's a perfect replica of real pinball tables. Plus the game does a good job explaining how the tables should be played. It's the only video pinball game that has ever made me better at the real thing. Man, I loved my VB. Yeah, it ws short lived and one of the screens is out of whack and doesn't work but I loved it anyway. I had my fun with it and this was one of those games that I played all the time. Ahh, good times. I second the love for the Williams table set the Wii (and PSP) got too noted in post 5. I loved that set and for $20 you'd be dumb to ignore it as it has a ton of tables, all perfect repros, and with the 2 piece controller and motion it feels right even the ability punch the table around too. The game has a great set of challenges and even normal play challenges to earn credits to unlock more tables to make them free(costs 100.) There's also a great HOW TO for each table with a ton of talking, images, and motions that shows how to set up things to score big. This game though is minor compared to it, but I mean really...one is a copy of a full scale table, and this is a really cool and small game inspired by a 3D system to give a new view of depth to a pinball title. It just has a few tables, but the few there are quite fun and they can keep you engaged for a good stretch in that dark cave you have to shove your face into to play. I used to have VB and I had this game so I can say that the rating here in description and scoring is quite fair. If they had a 1/2 point scale I'd have bumped to a 7.5 but 8 would be pushing it against other VB titles of the day. Dude....When I was a kid the pinball games would dispense Baseball Cards if you racked up enough home runs on the Baseball Theme Tables. I still have a hologram card I got from one of them. 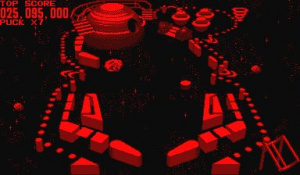 This game almost convinced me to buy a Virtual Boy.